Chicano Nationalist Art Displayed in Sacramento | Stop Obama Now!! 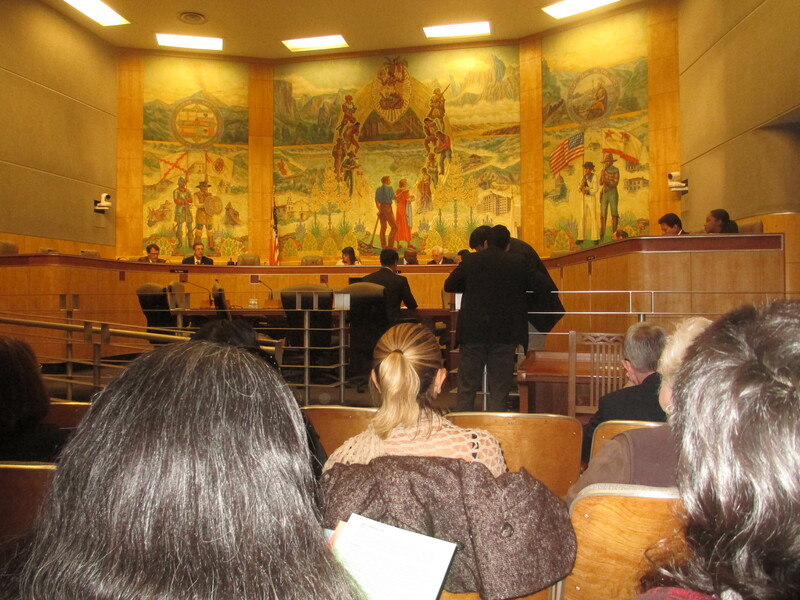 The weird symbolism of Chicano Supremacy and Mexican ethnic, mestizo racial nationalism is on prominent display in at least one important state Government building in Sacramento at the cost of taxpayers. 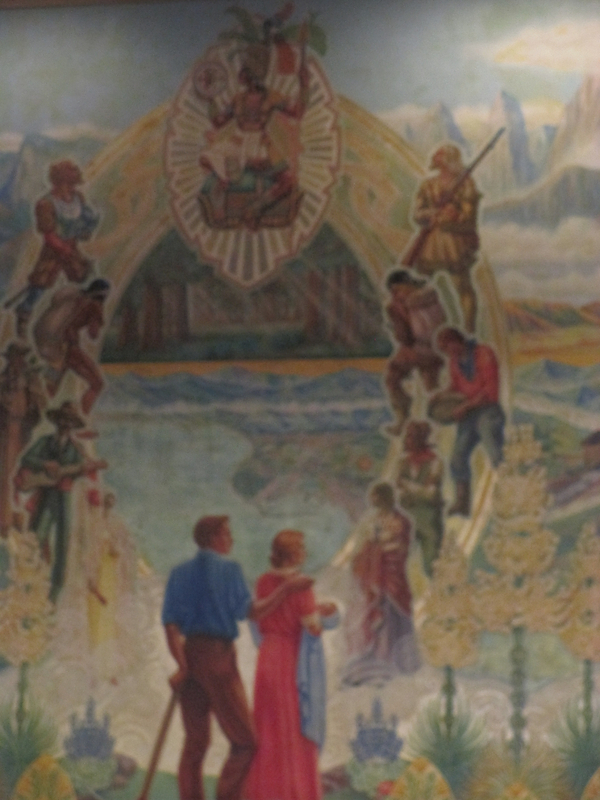 This obnoxious racialist mural is located in the Governmental Organization Committee Room in the Legislative Office Building in Sacramento, a place where some of the most important state decision-making is conducted. The belief is that this mural at one time displayed a Christian icon where the Aztec image is now located, turning it into a display of Mexican triumphalism. Chicano-ism is an esoteric, quasi-religious, neo-pagan, cult doctrine. which was inspired in large part by the writing of a Mexican Nazi agent, Jose Vasconcelos. Vasconcelos is known as the father of the indigenous movement, parts of which seek to restore the Americas to a pre-Colombian state, by elimination of the descendants of the colonizers, a genocidal concept. Chicano-ism is a mixture of Aztec neo-paganism, cultural Marxism and Nazi-like concepts translated to the frame of reference of Latino racial nationalism. The first thing one notices is the the Aztec warrior/priest in this painting is surrounded with a “glory,” similar to the way Mexican depict their patron saint, the Virgin of Guadalupe (Virgin Mary), which in Mexico is itself based on the Aztec god, Tonantzin. The glory signifies holiness or even god-hood. The Aztecs are held to be a race of Gods in Aztec mythology as well as in the Chicano cult doctrine. 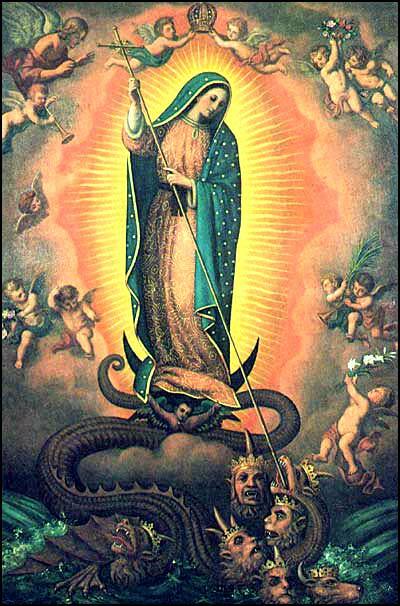 The Virgin of Guadalupe symbolizes the victory of good over evil as shown in this image below,with the serpent and demons at her feet. Next you see the Aztec warrior/priest is observing a globe, which represents the cosmos. The Aztecs believed that they could maintain cosmic order by means of their pagan religious rituals. They practiced a cult of blood. Mass human sacrifice of their enemies was carried out to maintain order in the universe. Defeated enemies were sacrificed to Huitzilopochtli, the Aztec Sun God and War God, in order placate him so that he would continue the daily cycle of the universe. 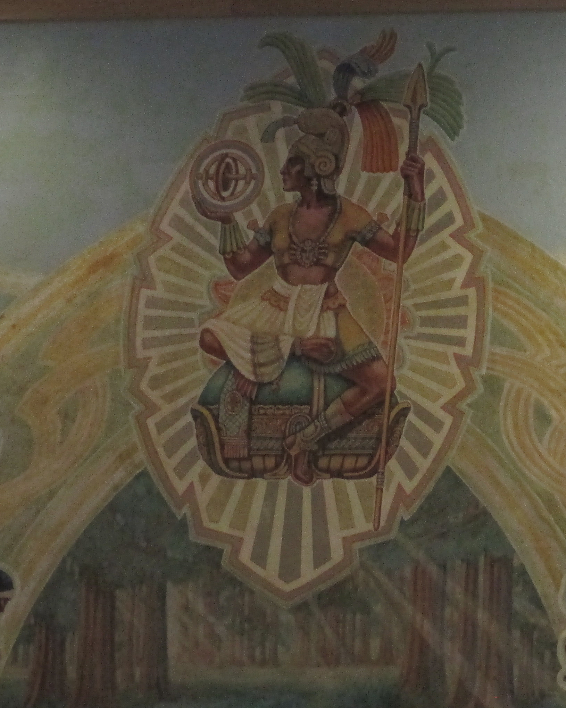 The Warrior/Priest in the painting even appears to have a disk representing the sun god hanging from his neck and he is contemplating universal order and thus can be a priest of Huitzilopochtli or represents even the sun god himself. The enemies of the Chicanos in this context are the European conquistadors and the Anglo settlers. 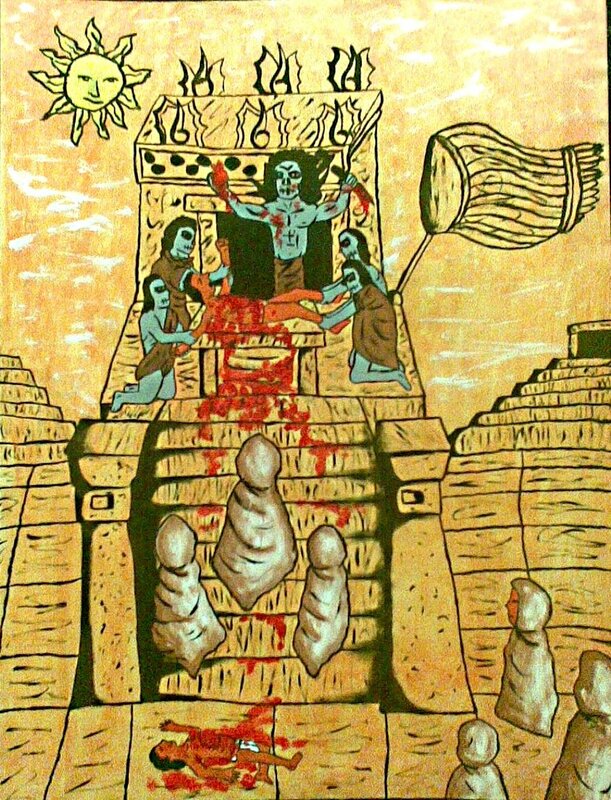 In this sense, one can interpret the symbolism of the painting as being genocidal against non-Latinos, i.e. whites of European descent. There are radical Chicanos, who believe such things. One of the founders of La Raza Unida political organization, Jose Angel Gutierrez, called openly for the elimination (ethnic cleansing) of the “Gringos” (see video here). The Spanish Conquistadors and Anglo settlers are depicted in inferior positions at the feet of the divine Aztec warrior/priest, much as the serpent and his evil demons are depicted at the feet of the Virgin of Guadalupe in the earlier image.. It is thought that there was originally a Judeo/Christian symbol or figure in the place that the neo-pagan, Aztec Warrior/Priest now occupies. 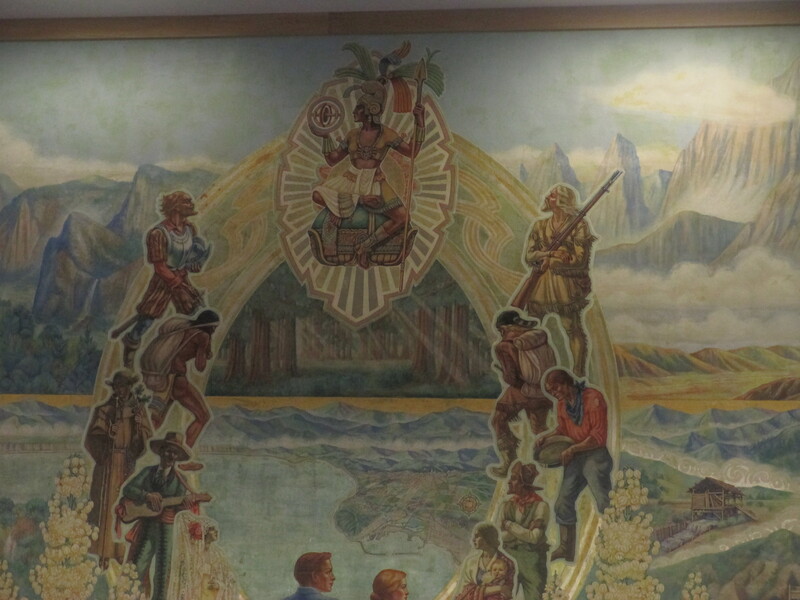 The current, mestizo racialist symbolism, which is totally inappropriate and ridiculous for a state office building. Whether you agree with the above interpretation, or not, at least it can reasonably be seen as representing Chicano/Latino supremacy above other peoples in California history. Because it is there in a state building it represents the perverse mentality of many of our current state politicians.